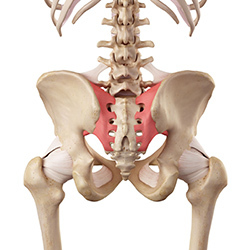 Sacro-iliac (SI) joint dysfunction is one of the more common causes of low back pain. It is usually located either side of the lower back, although it is often described as a band across the lower back. Pain may be an ache or sharp pain which can restrict movement. Pain can radiate to your buttock, groin, lower back and leg. Pain may feel similar to sciatica or pain caused by a lumbar disc herniation. Sitting with your legs crossed may cause pain. The sacro-iliac (SI) joints lie at the bottom of the spine, below the lumbar spine and above the tailbone (coccyx). It connects the sacrum (the triangular bone at the bottom of the spine) with the pelvis. These joints support the entire weight of the upper body when we are standing, which places a huge amount of stress on them. Exercise – Low impact exercise that help to maintain your movement, like swimming or Pilates. Specific exercises aimed at maintaining range of motion (ROM) in the spine. Avoid – High impact exercise, low seating, long car journeys until your symptoms improve. Therapy – Osteopathy, Medical Acupuncture, Hydrotherapy, Massage therapy, Instruction on workstation. 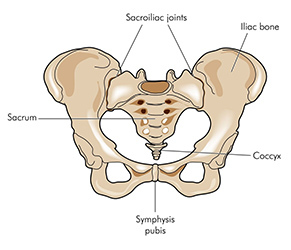 How Can Osteopathy help with your Sacro-iliac (SI) Joint Dysfunction? If Osteopathy is considered suitable then it can be highly effective in helping Sacro-iliac (SI) Joint Dysfunction, both for an acute episodes as well as long term management to help avoid further episodes. Our treatment is geared towards relieving the pressure on the nerves, muscles and joints, through a gentle combination of soft tissue massage, stretching techniques and joint mobilization. Click here to learn more about Sacro-iliac (SI) Joint Dysfunction by reading our Case Study.